If you're a young man that likes wearing slim fit style clothing, you can set the club ablaze when you walk in wearing these slim fit style dinner jackets and blazers by Tazio. These slim fit blazers have that red carpet ready look that just happens to work like crazy in the club. 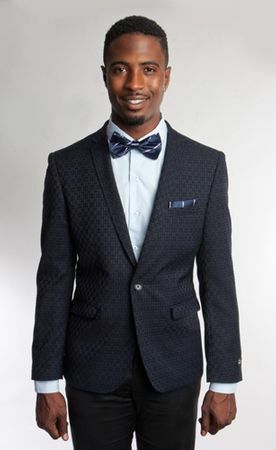 This navy blue jacket has link style pattern fabric and is double vented in the back. Made of microfiber.